A bath and shower combo is designed to give you everything you need when choosing items for a shower bath. In these packs you'll receive a bath or shower bath combined with a bath screen, shower kit and bath panel. Choose from modern and traditional styles to blend in seamlessly with the current look of your bathroom. 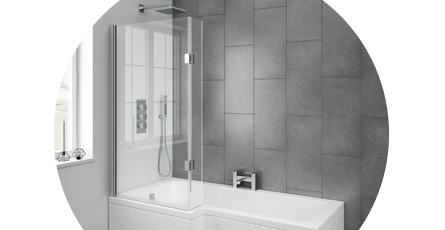 Whether you want a freestanding bath with shower or a standard bath and shower combo you'll always get the best value. Buying all of the items contained within these packs separately will no doubt cost you more, that's why we've put together some great value baths with showers to help save you money and time. We done our best to combine all the best options to ensure you get the essentials you need for your bathroom. Bath and shower suites can help you complete your bathroom faster and our experts have ensured that these important items all complement each other in both style and function.